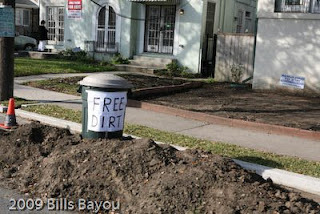 Bill's Bayou: FREE DIRT! FREE DIRT! FREE DIRT! I don't see this very often. Scratch that, I've never seen this before. 1) Am I going to get killed by trying to make a U-Turn on Claiborne Avenue to get a shot of this? 2) I thought it was SUPPOSED to be free. 3) Damned Real Estate market really HAS crashed. 4) I wasn't aware that Dirt had been arrested. 5) If only I had my Hot Wheels cars, I'd make some neat tracks in that. 6) Just how badly do these people need to gossip?